A number of young Iranian women including at least five university students have been stabbed in their hips with knives in past few days in southern city of Jahrom. According to the information received from source in Jahrom, at least 12 women have been victim of the violent attacks. The women were attached by at least four men riding on motorcycles. The local official have acknowledged that at least six women have been injured in the wave of attacks and they include five university students.Sources in the city said the university students have identified the attackers who are members of the regime affiliated paramilitary Basij Force. One of the attackers was identified as Beheshti, head of the Basij force in Ghotbabad, a town 15 kilometer south of the city of Jahrom. The attacks on university students are taking place as university students across Iran is expected to take part in yearly protest on the occasion of Student Day on December 7 – known locally as 16 Azar – to demand political freedom in Iran. This year protest is expected to address the last month acid attacks by the regime’s gangs that targeted many young women and girls leaving them with severe burns and injuries. Some lost their eyesight and at least one person reported killed. 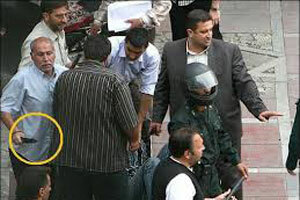 The Iranian regime officials in the city have claimed that have arrested those involved in the attack against the women but they did not provide any information about the attackers and their motivations for carrying out such crimes. Earlier this month the Iranian regime’s parliament approved a bill officially putting the members of the Basij paramilitary force in charge of enforcing dress code in Iran and harassing and repressing women and youth in public under the pretext of “Promotion of Virtue and the Prevention of Vice”. The law which passed with a majority institutionalized the work of members of the Basij paramilitaries that often patrol streets to enforce dress code and other behavior prescribed under the clerical regime’s misogynist laws. The new law bolsters the work of Basij members that often patrol streets, and stop cars to interrogate couples about their relationships, to the resentment of many Iranians. Acid attacks began after the Iranian regime’s parliament began reviewing bills empowering the Basij paramilitaries.